Portal's silent protagonist will have a lot more dialogue to listen to in Portal 2. One of the reasons Portal 2 was recently delayed by a couple of months may have something to do with how different it truly is from the original Portal. If the game's headache inducing gameplay videos didn't convince you, maybe this will: Portal 2 features 13,000 lines of dialogue. Valve revealed the impressive number to IGN. This jump in the amount of dialogue isn't the result of GlaDOS having her speech chip upgraded, but instead comes from the addition of new "characters" like the player's AI sidekick Wheatley. Anything that can talk in Portal 2 has apparently become more chatty, including turrets, while the Atlas and P-body from the game's co-op mode might also have a few lines to say. For comparison's sake, Grand Theft Auto IV is said to include around 80,000 lines. 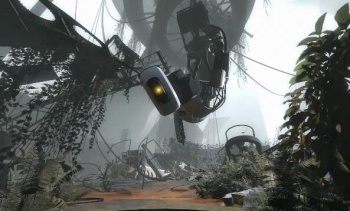 For the sequel to a game that basically had a computer yelling at you from time to time for 5-10 hours, it looks like Portal 2 is receiving quite the upgrade not only in the gameplay department, but in the story department too. This is good news, because the underlying story in Portal, sparse as it may be considered, was just as engaging as its portal hopping.